The delivery of patient food service meals continues to adapt to changing cultures and higher demands for patient satisfaction outcomes. Nearly 20 years ago, when I first got into the healthcare space, patients did not always have an opportunity to choose a meal preference and for those that were able would be ordering tomorrow’s meals today. For the past 10 to 15 years, healthcare organizations have been implementing a healthcare modified version of hotel room service. Patients are able to select a meal choice from an in room menu, call down to a call center and place the order with the expectation that it will arrive hot and fresh within 45-60 minutes. The implementation of room service has proven benefits but it appears that not all patient scores continue to stay high; this is partially due to the changes in patient acuity. Since healthcare reform in 2010, the in-patient population acuity levels are much higher and the average length of stay has decreased from previous practices. The response: Implement a hybrid room service/traditional tray line service model. Within the last month, I have had the experience to work with two healthcare systems that have adapted the hybrid patient delivery models; the first takes us to NC. This large medical center has two separate room service lines, previously feeding about 400 patients from each line. The staff was bogged down by “house trays” that were prepared for those patients unable to participate with the room service program for various reasons. Instead, they created a small traditional tray line area and were able to divert about 150 trays or 19% of the patient feeding per meal period from the room service lines. The second was a 250 bed facility in NY that also incorporated a hybrid room service model. Patients that were provided meals at fixed meal periods were prepared in a specific area in the kitchen, separate from the room service line. In some cases, patients are able to provide meal preferences but receive trays at fixed times during the day to help control insulin levels, aid in program activities for psychiatric patients, are Out Patient, etc. These trays are also commonly prepared on a separate tray line. 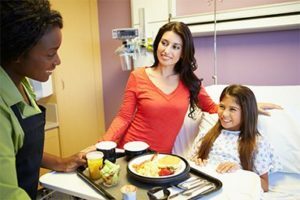 Since lower acuity patients may not be admitted to the hospital but experience an extended Emergency Department visit and the fact that the majority of patient admits derive from the ED, we see that room service is being offered to these patients as well so each dining experience is favorable. If your health system hasn’t implemented room service and you are looking for assistance in this area, please contact us to consult with our room service specialist.